NEW YORK (CNNMoney) -- They are the "super committee" -- and they have a lot of work to do. Almost all men -- they are the 12-member panel charged with finding an additional $1.5 trillion in debt savings over a ten-year period. It will be tough work and will likely require political sacrifice on issues like taxes and entitlements if meaningful progress is to be made toward stabilizing the national debt. On Thursday, House Minority Leader Nancy Pelosi weighed in with her three Democratic picks: James Clyburn, Xavier Becerra and Chris Van Hollen. The panel's six Republicans were named Wednesday to the body, joining three Senate Democrats. The members have a range of political experience -- from novice to veteran. They are experts in taxes and the budget process. They hail from states as disparate as Texas, Michigan and Arizona. In a sign that these appointees might not be the most willing to compromise, four of the members -- two Republicans and two Democrats -- served on the Simpson-Bowles deficit reduction panel but voted against the plan. Norman Ornstein, a resident scholar at the American Enterprise Institute, said that if the goal is a grand compromise, the appointments "could have been a lot worse," but that this group "is not going to leave me dancing on a cloud." The committee will have until Nov. 23 to propose ways to reduce deficits. Those proposals must be voted on by Dec. 23. If the committee process fails to produce a debt reduction plan, as much as $1.2 trillion in across-the-board cuts would kick in -- evenly divided between defense and non-defense spending. Here's a little about each member of the committee. Rep. Jeb Hensarling of Texas (Republican and committee co-chair): Hensarling -- chairman of the House Republican Conference -- served on President Obama's debt commission but voted against it. What did he object to exactly? Tax increases. The debate over taxes is expected to be fierce. If his past positions are any clue, Hensarling is likely to be vocally opposed to any new revenues. Sen. Patty Murray of Washington (Democrat and committee co-chair): Murray is not just a senator. She also chairs the Democratic Senatorial Campaign Committee, and it is her job to recruit candidates who can beat her Republican colleagues. Her appointment has already drawn criticism from the Republican National Committee, which views her as an overly political figure. She is a member of the Budget and Appropriations committees. Rep. Chris Van Hollen of Maryland (Democrat): Van Hollen played a key role in the debt talks led by Vice President Joe Biden earlier this year, and is the ranking Democrat on the Budget Committee. A Pelosi acolyte, Van Hollen frequently appears on television to represent House Democrats on policy issues. Sen. Jon Kyl of Arizona (Republican): The No. 2 Republican in the Senate behind Mitch McConnell and a staunch advocate for the military, Kyl is a member of the Finance Committee. Kyl is a reliable conservative vote and is opposed to tax increases. He has said he will not run for re-election and walked out of debt negotiations with Biden earlier this year after an impasse over increasing revenue. Sen. John Kerry of Massachusetts (Democrat): A former presidential candidate, Kerry is best known on Capitol Hill for his foreign policy experience. He will lend his expertise on national security matters to the debate over cuts to military funding. He is a member of the Finance Committee and has spent 27 years in the Senate so has participated in his share of closed-door negotiations. Sen. Pat Toomey of Pennsylvania (Republican): Elected to the Senate last year, Toomey was a prominent voice in the debate over raising the debt ceiling, arguing that the United States could prioritize its payments in the event of a debt ceiling breach to avoid a true default. 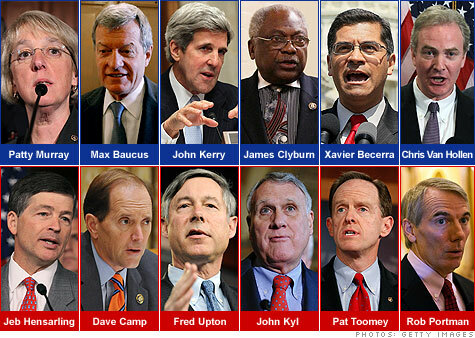 In the end, Toomey voted against the debt ceiling bill that created the super committee. He sits on the Senate Budget and Banking committees, and is the former president of the staunchly anti-tax Club for Growth. Sen. Max Baucus of Montana (Democrat): Baucus -- chairman of the Senate Finance Committee -- served on Obama's debt commission. But Baucus voted against the final Simpson-Bowles recommendations because he said they cut too deeply into farm subsidies and would have changed Medicare, Medicaid and Social Security in away he found unacceptable. Those same issues -- changes to those entitlement programs -- are likely to be a central part of any grand bargain to reduce deficits. Sen. Rob Portman of Ohio (Republican): A former White House budget director in the Bush administration, Portman is a Senate novice and a member of the Budget Committee. More moderate that some of his colleagues, Portman could be a key player in a compromise. Rep. Xavier Becerra of California (Democrat): A senior member of the House Ways and Means Committee, Becerra served on the Bowles-Simpson debt commission. But he voted against the plan because he said it cut too deeply into discretionary spending and did not raise revenues to a high enough level. Rep. Dave Camp of Michigan (Republican): Camp -- the House Ways and Means Committee chairman -- served on President Obama's debt commission, but voted against it. He objected to the plan's tax hikes and said it failed to address rising health care costs. An expert on taxes -- he will bolster GOP credentials on any tax reform that might be discussed. Rep. James Clyburn of South Carolina (Democrat): The third-ranking Democrat in the House and veteran of the Appropriations Committee, Clyburn maintains close ties to Pelosi. He also participated in the Biden debt reduction talks. Rep. Fred Upton of Michigan (Republican): Upton chairs the House Energy and Commerce Committee. He has taken some moderate positions in the past, including attempts to decrease tax cuts in the George W. Bush administration that remain contentious today. Debt super committee takes shape. What now?